Water removal is exactly that, removing or extracting excess water from your home or business. ServiceMaster of Columbia has yellow trucks especially for water removal. 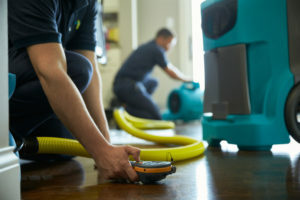 They have powerful pumps and truck mounted vacuums that remove the water quickly to help reduce the amount of damage. All of our technicians are local and we have a team on call 24/7 so we can get to your loss quickly at any time of the day or night. hygrometer to measure the extent of the moisture damage to the structure. Our technicians also inspect the flooring. They will communicate with the homeowner or property manager if the carpeting, flooring, etc. will need to be removed. It is highly likely that if there is carpeting, the carpet pad will be removed as it becomes a breeding ground for mold once it becomes saturated with water, and is relatively cheap to replace. Next the technician will place commercial air movers under the carpet to begin the water removal process and facilitate drying, removing the moisture remaining in the carpet and turning it into airborne water vapor. This water vapor is removed from the air using commercial dehumidifiers coupled with your HVAC system. Dehumidifiers convert the water vapor back into liquid form and automatically pump it out of the home. If necessary, we set up HEPA air filters or air scrubbers to ensure clean indoor air quality. We also apply EPA approved anti-microbial products to the subfloor, walls and carpet to prevent the growth of bacteria, mold and mildew. Homeowners, business owners and or property managers can expect to have air movers going for at least two days but it can be up to seven depending the extent of the damage and loss classification. 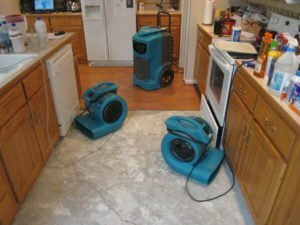 ServiceMaster of Columbia is the leading water removal company in the business, dedicated to protecting your biggest investment. We should be your FIRST CALL when you have water in your home. Call the Master of Disaster at 573.443.8383.